‘Champions Forever’ sigs: Real or fake? 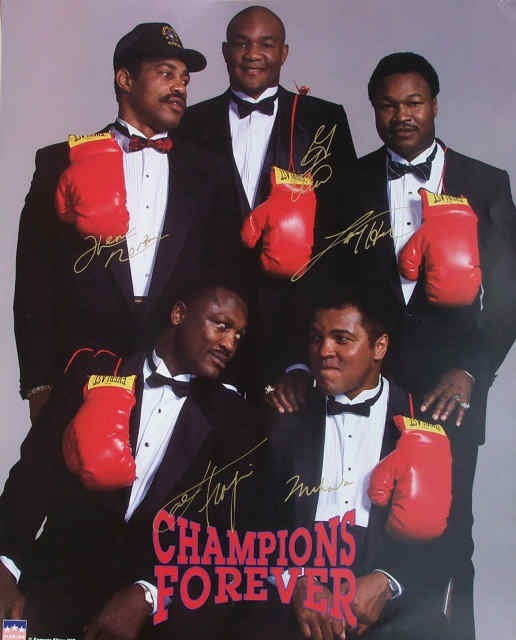 The boxing greats (seen above in the signed poster) are, clockwise from bottom right: Muhammad Ali, Joe Frazier, Ken Norton, George Foreman, and Larry Holmes. All of them were, at one time or another, heavyweight boxing champions of the world. Lots of these posters are available online, and when I clicked over to eBay as research for this post, at least one copy signed by all five men was up for auction. The last chapters of Operation Bullpen focus on the John Olson-Chuck Wepner counterfeit scheme in which Olson forged Muhammad Ali autographs on a variety of Ali merchandise, including photographs of Ali and Wepner, the now-retired, working class New Jersey pug who battled Ali in a memorable 1975 brawl that may or may not have been the inspiration for the first “Rocky” movie. (Wepner claims it was; Sly Stallone says he created the character from lots of sources.) In any case, Wepner sold forgeries in partnership with Olson, and in 2002 the FBI busted them both. Each received probation for their crimes. One of the most popular items they scammed people with was the “Champions Forever” poster, which was based on a 1989 video of the same name. 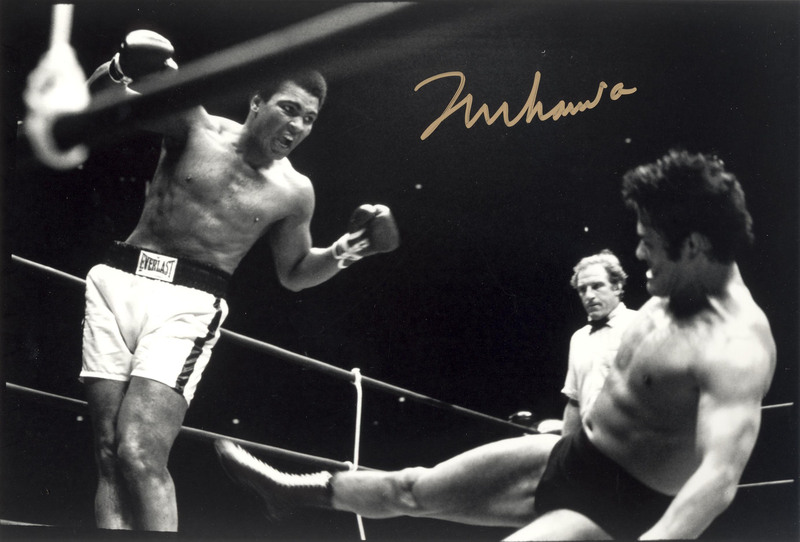 Olson, who became a master Ali forger and whose phony Ali sigs are still being sold today as authentic (one of his fakes is below), forged all five of the boxers onto stacks of posters that he printed (he was also a printer, by trade). Then, with Wepner serving as front man and capitalizing on his own real-life boxing cred, they sold hundreds and hundreds of them and made wads of money. When he saw the posters Larry Holmes’s manager said his client’s signature was a clear fake, and Ali’s people were so certain that Wepner was peddling fakes they contacted the FBI to see if they could help bring him down. So, are the autographs on this “Champions Forever” poster fake or genuine? Well, I’m not an autograph expert and cannot say for certain. But I think you can guess from my response what my opinion is. Kevin Nelson’s latest writing on forgery, Husband, Father, Forger: The True Story of a Bookselling Scam and How It Saved—and Nearly Ruined—One Man’s Life, will be released this fall.